HopperKowalski, BostonRed, freisland and 2 others repped this. Jeugdspeler Kik Pierie( foto) van sc Heerenveen neemt momenteel met Oranje onder 15 deel aan een vierlandentoernooi in Turkije. Tom Collingsworth, Testudo and Winoman repped this. Huh? Whose name in the US hints at an American family? Everyone has a surname of foreign origins here be it English, Irish, German, Italian, Dutch, French, Nigerian, Chinese, Japanese, Egyptian, etc. etc. monere and Mario Balotelli repped this. So why is he in this thread, as he obviously is Dutch? Because he was born in the US, thus making him a dual citizen of the US and Netherlands. And for all we know one of his parents is American as well. RidiculousLichaj, HopperKowalski and BostonRed repped this. Stijn is listed as having been born in Netherlands by transfermarkt and the Heerenveen website while the Heerenveen website lists that Kik was born in the USA. Does that mean Kik is eligible for the USA and Stijn isn't? Certainly possible if the parents/grandparents have no other link to the US. Just like Desevio Payne is eligible for the US because he was born here, but his younger brothers aren't because they were born in the Netherlands (and dad is a naturalized citizen). The Paynes could move to the US to fix that, but probably not in the Pieries' case. Playing for Netherlands against the USA at the Nike Friendlies. Pl@ymaker, Winoman, Tom Collingsworth and 1 other person repped this. Dave Marino-Nachison and Brotheryoungbuck repped this. Kik Pierie made his debut in Saturday's friendly against Drachtster Boys. He looks quite calm and poised with the on ball movement. Especially for a 15 year old playing alongside pro teammates. It's still a bit too early to expect he will remain with the senior team to begin the new season, but if he continues to show strides then definitely could be an option later on in 2017. Tom Collingsworth, ChuckMe92, Winoman and 1 other person repped this. But can he play Tiki-Take? Here are the Pierie brothers, from left to right -- Kik, Take, Stijn. According to this article, which you have to register to read, Stijn's idols are Xavi and Jordi Alba, Kik's is Jan Vertonghen, and Take's is Manuel Neuer. No mention of an American connection in this particular article. It does mention their father is a gastrointestinal, liver, and surgical oncologist at Medical Center Leeuwarden, the largest non-university hospital in all of the Netherlands. Pure speculation: maybe the father had a medical residency or fellowship in Boston, which is listed on Transfermarkt and other sources as Kik's birthplace? There are a number of very prominent hospitals there, including Boston Medical Center, Mass General, Brigham & Women's, and Tufts, to name a few. Quite an accomplishment. He's definitely one for U.S. Soccer to watch out for. HopperKowalski, Winoman and BostonRed repped this. Is he the youngest first team debute of the YA forum? Does a preseason friendly against a fifth-division amateur team count? So Kik's soccer idol is Jan Vertonghen -- and Kik's Transfermarkt page shows him as a left-footed center back who can also play left back, just like Vertonghen. Many of us surely remember Vertonghen vs. the US in the World Cup two years ago and how prolific he was on offense despite his left back position. And this kid, two weeks shy of 16 years old, already made his debut with an Eredivisie club. I really think the USSF should come calling if they haven't already. Indeed, Kik Pierie knows what he wants. ,, It's my goal to really get the world.I'm talking about Real Madrid, Bayern Munich, Barcelona. I want that. I want to go to extremes. If it appears that Heerenveen is the top and I have everything removed, then that's no problem. If the Ajax one is fantastic. But I think you should aim for the maximum. " Hard work, discipline and goal setting. Where it begins, said Pierie. ,, I have a lot to my parents, both former top hockey players. They say many wise things.My father (. Surgeon at the MCL, ed) often has a Latin proverb to: mens sana in corpore sane . A healthy mind in a healthy body. Find a good balance is crucial. " ,, Yes, I have let a lot. Friends have arranged a party on Fridays, but I'm at ten o'clock to bed. Deliberately. If you want to reach the top, there is 'nice things' not much room. Occasionally distraction with family and friends well, but it takes me about football. " Kik Pierie - his brothers Stijn and Take also play football in the youth of Heerenveen - had sat after the game some muscle pain in his calves. The additional burden of recent weeks was felt. ,, He has deliberately not participated in any training, "said Streppel. ,, That would have been too much. " This week will be an evaluation. Probably the remains anyhow in two weeks with the first selection, but who knows. ,, In principle, I go back to the A's to develop myself. I try to promises or even to get the first this season. If they find at Heerenveen that it is time for it, then it's time for that. " Let's go back to his goal. Preferably ,, I would ever play for Real Madrid, "said Kik Pierie. ,, That white dress that royal, I like that. I feel that I have made after only a millimeter today on the way to the top. I know there is much, much more is needed to succeed as a footballer. " Gacm32, Tom Collingsworth and BostonRed repped this. In my book appearance on a team sheet of a KNVB referee does count. Far be it from me to tell you what to put in your book! I know it's awful early in his development to really determine if he will live up to the hype, but maybe we should try to get this kid involved in our youth teams asap. It looks like Kik has a real chance to make SC Heerenveen's first team. Voetbal.nl lists him as a new transfer yesterday into Heerenveen for 2016-17, arriving from Heerenveen B-junioren. A profile has been created for him on the website for Heerenveen's first team, and he's in the official 16-17 team photo. He's also now listed with the first team on Heerenveen's Wiki page. 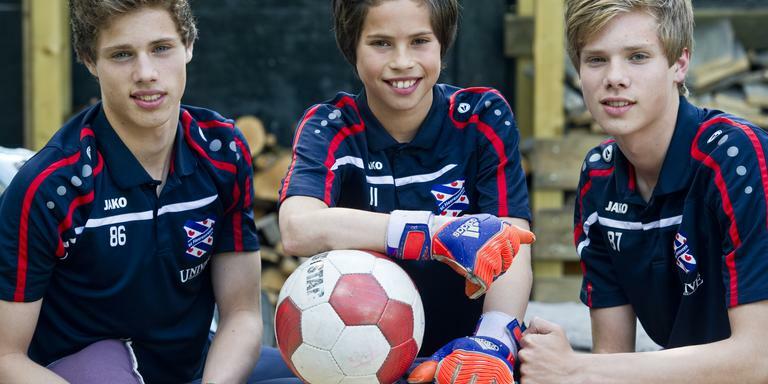 Edit: and yes, Heerenveen's uniform sponsor is called "Kika." Testudo, HopperKowalski, Gacm32 and 2 others repped this. Wow, there's always an out-of-nowhere YA. Maybe this is our guy this year.